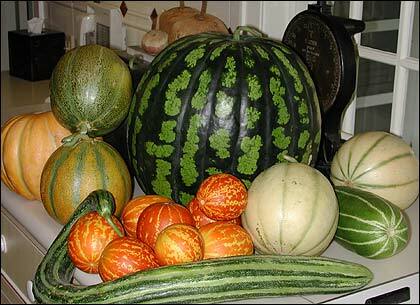 Heirloom melons take an impressive array of shapes and sizes. Heirloom Melons: Grow your own ... they're beautiful in the garden and delicious on the table. As many devoted gardeners know, heirlooms aren't just for ANTIQUES ROADSHOW. But when it comes to melons, a lot of people avoid growing their own because of a perception that it's difficult. Well, melon maven Amy Goldman recently visited the Victory Garden to prove it isn't, and in the process gave Michael Weishan a tutorial in planting his own high-end melon patch. As she told him, heirloom melons are "a luxury nearly everyone can afford to grow, if you follow a few simple rules." As applied to melons, "heirloom" refers to varieties that have been preserved by gardeners and farmers for at least as long as 50 years. Not just your average honeydew, heirloom melons are beautiful — sometimes strangely — as well as delicious. Some have cobs like corn, or crunch like cucumber; other's Amy calls "apple impersonators." And the snake melon speaks for itself. These three-week-old 'Jenny Lind' seedlings are ready for the garden. Amy insists that raising these exotic garden beauties is not difficult: Vigilance, not specialized skill, is the key to success. To test that assertion, we decided to try some heirloom melons at the Victory Garden, and Amy was on hand to walk Michael through the steps, promising that come August the fragrance of homegrown melons will be irresistible. Perhaps the first question is: Where do I get the seeds? It's relatively easy. There are a great number of commercial seed houses that offer heirloom melons (an Internet search on "heirloom melon seeds" yields a host of choices), as well as individual seed savers who offer them on exchanges. No doubt Amy's devotion to melons is exceptional, but she told Michael she's also not averse to taking seeds home off her dinner plate at restaurants.) But no matter what lengths you choose to go to, what you're looking for are plump, vigorous seeds. Avoid any ones that appear wrinkled or shriveled. Once you've made your seed selections, be sure to label them right away, since melon seeds all look more or less the same. Lots of organic matter, and black plastic sheeting, help create the melons' ideal growing conditions. Now you're ready to plant. Start with sterile potting mix in 4-inch-diameter pots. 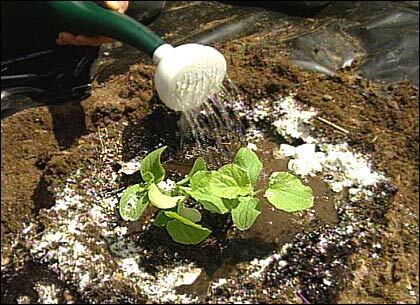 You want to begin with a very moist and warm environment, so pre-water generously. Amy begins with five seeds to a pot, arranging them on the soil surface and plunging them with a finger to a depth of about an inch. Cover over with soil and pat down. Next, you need to create a dark, warm, moist environment for the seeds to germinate in. Amy prefers to place her starter pots in a plastic storage bin with a lid (such as those for storing sweaters under the bed). At 75 to 85 degrees, your seeds should take about a week to germinate, and if you have trouble maintaining that temperature, try one of the electric heating mats available from your garden center. For some seeds with harder coatings, such as watermelon, it also helps to soak them overnight in water to soften them up prior to planting. This is where the vigilance starts. Amy says to check your pots two to three times a day — as soon as you see that the seeds are sprouting, get them directly under a light source. You can give them about a week of fertilizer solution once they start to show their first true leaves. At two to three weeks, the plants should be about four to five inches high. Check that there is no sign of disease, and of the five seeds you planted in each pot, eliminate the one or two with the weakest stems, at which point you're ready to transplant to the garden. After adding a dose of diatomaceous earth, water in the plants generously. Melons are very heavy feeders, so soil enrichment, starting in the fall, is essential. Amy says light, sandy loam soil is perfect, and the soil should be at least 60 degrees before transplanting. At that point, the key is to make a "comfortable" bed for your melons to lie in. Plan your melon hills to be 8 to 10 feet apart so the crawling vines will have plenty of room to grow. Add more organic matter (we used cow manure) and till or fork it in. Melons like hot, sunny growing conditions, so in the Victory Garden melon patch, we also put down black plastic, which conserves moisture as well as temperature. Take your clump of three or four melon seedlings out of the starter pot and plant it at ground level and pat it in. Then use your hands to form a saucer of soil around the plant to direct the water to the roots as it soaks in. Around each plant Amy then adds a sprinkling of diatomaceous earth — a natural product — to ward off slugs. Water the plant well and add a bit of fertilizer if you choose. Finally, for the crowning act of care, Amy recommends erecting over each plant a tent of spun polyester cloth, galvanized steel hoops and earth staples or bricks. This will protect the young melons pants from wind and predatory insects, increase the temperature around them by 5 to 8 degrees, and conserve moisture. Spun polyester is also handy because you can water straight through it. Amy and Michael erect a protective cloth tent over the young melon plants. Labeling a tall wooden stake and pounding it in at the planting hole will make it easy to know where to water as the melons begin to grow. Which with any luck they will do very quickly. You may even find yourself remarking that the vines are "taking over." But when the end of summer comes, practically all your senses will be gratified you took the trouble. Also see Amy Goldman's recipe for melon soup. This segment appears in show #2810.